Mojax is a framework that provides the best of Ajax but on a mobile platform. John leads developer relations for Mojax. He can be reached at [email protected] or visit his blog at 360Mobile.us. To get started with Mojax development, go to mojax.mfoundry.com. Here you will find documentation, tutorials, and information on how to install an Eclipse plug-in that is designed for developing and testing Mojax applications. When running the application, clicking on the Search option lets you specify the street address, city, and state of the property you want to search for. 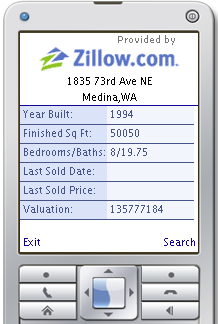 If the address that you enter is found, the main screen displays the updated property information; if the search fails, a message is returned.